Educators and students participate in groundbreaking STEM initiative exploring deep-sea biology, geology and archaeology in the Gulf of Mexico and Eastern Pacific. (Philadelphia, PA – April 16, 2015) — Rebecca Rutstein, represented by the Bridgette Mayer Gallery, has been selected as a 2015 “Artist at Sea” Science Communication Fellow and will sail aboard Exploration Vessel (E/V) Nautilus during its 2015 expedition. Rutstein will join the Corps of Exploration aboard E/V Nautilus in July as they explore from the Galápagos Islands to the southern California coast, focusing on an area 1000 nm west of Colima, Mexico to international waters, where there are two sites of interest for seafloor mapping. Twenty-eight educators and twenty-six students from around the world have been selected from a competitive pool of applicants by the Ocean Exploration Trust (OET) to participate at sea during the 2015 Nautilus Exploration Program expedition. OET, a nonprofit founded by Dr. Robert Ballard in 2008, has the mission to explore the ocean, seeking out new discoveries in the fields of geology, biology, maritime history, archaeology, physics, and chemistry while pushing the boundaries of STEM education and technological innovation. The selected educators and students hail from schools, universities, science centers, aquaria, and non-profit organizations in twenty-five states in the US and five countries. They will join the Nautilus Corps of Exploration during sea-going expeditions from April through October in the Gulf of Mexico, Galápagos Islands, and Eastern Pacific Ocean. Rutstein is one of the first “Artists at Sea” invited onboard the Nautilus as a member of the Corps of Exploration. Bringing artists and scientists together can forge new perspectives in both disciplines, and communicate scientific research and technological innovation to a broader audience. Just as early photographer Charles Nègre (1820–1880) wrote, “Where science ends, art begins", Rutstein will witness and interact with live mapping data while on the ship and incorporate this experience into her new work. “As a visual artist whose work is inspired by geology, mappings and the undercurrents that shape the world we live in, it is the chance of a lifetime to be part of the 2015 Nautilus expedition. I am thrilled to communicate with audiences from around the world through live interactions, and to work side-by-side with scientists who will map out never-before-seen ocean floor topography – discoveries that I will fuse into paintings on and off the ship”. OET promotes science, technology, engineering, and mathematics (STEM) education around the world using the excitement of exploration and innovation to inspire the next generation of scientists and engineers. In 2014, OET began targeting its suite of education and outreach programs to specific communities through an exciting new initiative, the Community STEM Program (CSP). The CSP allows partner communities to engage community members from public audiences to young students, early career professionals to educators in a series of opportunities focused on STEM fields and vocations. This cohesive pathway of programs increase the impact the programs can have in any individual location. OET’s focus on the CSP represents a new approach to forge relationships among community partners with the common goal of increasing STEM literacy and proficiency. The 2015 Science Communication Fellowship Program, an initiative of OET, will bring twenty-two formal and informal educators together from around the world as a part of the Nautilus Corps of Exploration. Fellows are charged with the responsibility of engaging students and the public in the wonders of ocean exploration, sharing discoveries from the 2015 mission, as well as inviting others to learn aspects of daily life aboard a working exploration vessel. Fellows receive four days of intensive training at the University of Rhode Island Graduate School of Oceanography, and then spend two to three weeks aboard Nautilus between the months of April and October, as it explores the Gulf of Mexico and Eastern Pacific Ocean. An equally important aspect of the program is that the Fellows bring the expedition and excitement of ocean exploration back to their home communities after they have returned from sea by incorporating their experience into classroom lesson plans, community presentations, and through informal educational opportunities. The Science Communication Fellowship is made possible with sponsorship from Bechtel, the Office of Naval Research, the Florida Panthers Foundation, and private donations. 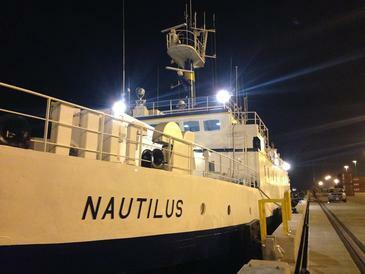 The public, scientists, educators, and students can join Rutsteins’s adventure while she is at sea via streaming video on the Nautilus Live website, www.nautiluslive.org, a 24-hour portal bringing expeditions from the field to onshore audiences through telepresence technology. The public can also follow the expedition on social media − on Twitter as @EVNautilus and on Facebook or Instagram as NautilusLive − and through in-person live interactions at partner museums, aquaria, and science centers around the world. The Ocean Exploration Trust was founded in 2008 by Dr. Robert Ballard to explore the ocean, seeking out new discoveries in the fields of geology, biology, maritime history, archaeology, physics, and chemistry while pushing the boundaries of STEM education and technological innovation. Our international program is launched from aboard the Exploration Vessel (E/V) Nautilus, offering live exploration to participants on shore and the public via live video, audio, and data feeds. The major 2015 expedition and education sponsors are the U.S. National Oceanic and Atmospheric Administration, Bechtel, the Florida Panthers Foundation, CITGO, Office of Naval Research, the National Geographic Society, University of Rhode Island, and additional private donors. Follow us online at www.nautiluslive.org, on Facebook and Instagram at NautilusLive, and on Twitter as @EVNautilus. Rebecca Rutstein received her MFA from the University of Pennsylvania in 1997 and her BFA from Cornell University in 1993. She has completed residencies at the Gullkistan Residency program (Laugarvatn, Iceland), the Red Cinder Artist Colony (Na'alehu, Hawaii), the Banff Centre for the Arts (Banff, Canada) and the Vermont Studio Center (Johnson, Vermont). Rutstein has also been a visiting artist at Bucknell University (Lewisberg, PA), Rutgers University (Camden, NJ), Tyler School of Art (Philadelphia, PA), Moore College of Art and Design (Philadelphia, PA), University of the Arts (Philadelphia, PA), University of Texas (Tyler, TX), and Swarthmore College (Swarthmore, PA). She was the recipient of a Pew Fellowship in the Arts, a Bridgette Mayer Travel Grant, a Pennsylvania Council on the Arts Grant, a Pew Professional Development Grant, and an Independence Foundation Fellowship in the Arts. Her extensive exhibition record includes solo shows at the Philadelphia International Airport (Philadelphia, PA), Sylvia White Gallery (Los Angeles, CA), Swarthmore College (Swarthmore, PA) and Fleisher Art Memorial (Challenge Exhibition). Since its establishment in 2001, the Bridgette Mayer Gallery has represented and exhibited artists whose work displays the variety and genius of contemporary art now being created in the US. The gallery’s ongoing exhibition program will continue to support established gallery artists even as it looks beyond the US to discovering and cultivating new talent from around the globe. The gallery exhibits painting, sculpture and photography with an emphasis on innovative process and content-driven ideas that speak to beauty, technology, culture and the contemporary landscape. Housed in an historic 1799 Philadelphia brownstone, the gallery presents ten exhibitions a year in its 3,000 square foot space and participates in numerous art fairs in the United States.